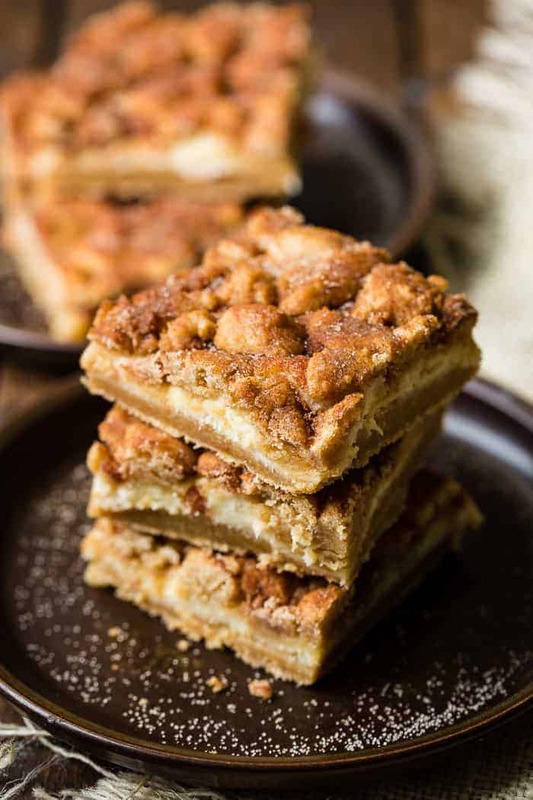 Snickerdoodle cookies were one of my favorite things as a kid, and these Fantastic Snickerdoodle Cheesecake Bars are those cookies on a whole new level! What is it about cheesecake bars as an adult that makes us feel so fancy? As a kid there was nothing like being given a cookie, but give an adult cheesecake and you’re the hero of the day. 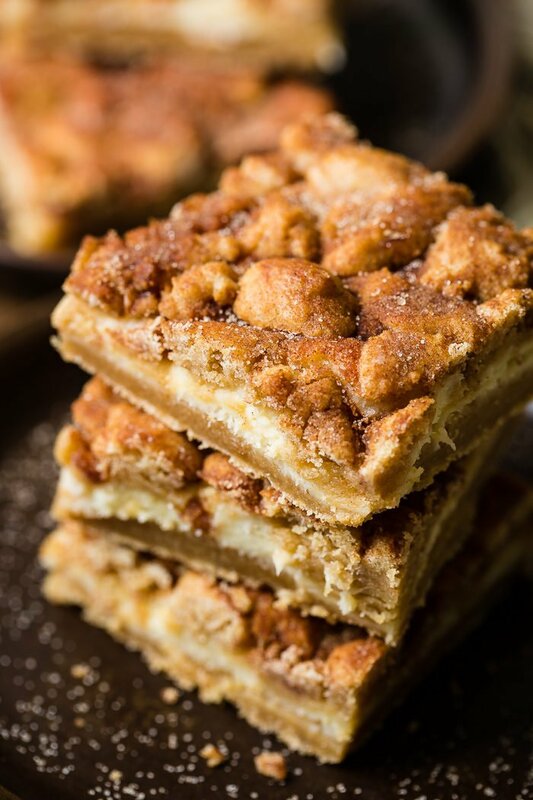 These soft, chewy Fantastic Snickerdoodle Cheesecake Bars are the best of both worlds, the snickerdoodle cookies we all know and love and that classy older sister, cheesecake! As you know, I didn’t like cheesecake as a kid. In fact, there are still some cheesecake recipes that are not my favorite, just like there are some cookies that aren’t my favorite. Hello Samoas. I know, you just fainted. Now things are different. And not only are we pro cheesecake, but we even have a whole cookbook, in fact the best cheesecake cookbook ever! 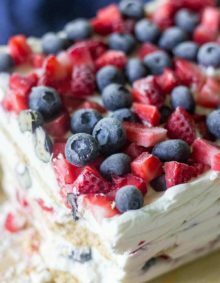 One of our absolute most favorite bloggers ever, Jocelyn from BruCrew Life has published the best cookbook ever for all of you cheesecake addicts. Like, really. We are so picky about cookbooks and this Cheesecake Love Cookbook is our pick. There’s photos all throughout the book and more information about pulling off a beautiful cheesecake than any of the other books we’ve gotten. 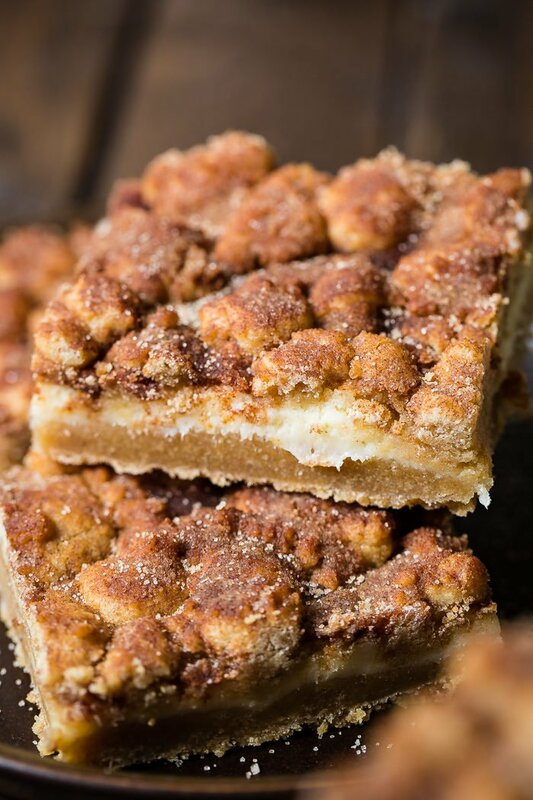 These Fantastic Snickerdoodle Cheesecake Bars are proof. I mean, a perfectly soft and chewy crust that can hold up to the cheesecake in the center and then all of that topping covered in cinnamon sugar? OBSESSED. I kid you not. How Were Snickerdoodles Invented and Named? When I was starting to write this post I thought I’d see what questions people were asking us about snickerdoodles and the first 3 all had to do with how snickerdoodle cookies were named and how snickerdoodles were invented. After a little digging, The Joy of Cooking says that snickerdoodles are probably from German origin, and that the name is a corruption of the German word Schneckennudel (“snail noodles”). Not sounding quite so yummy now, is it? It is also possible that the name is simply a nonsense word with no real meaning, originating from a New England tradition of whimsical cookie naming. Can cheesecake bars be frozen? They sure can but in this case, because we are adding in snickerdoodle cookies for the crust and topping you’ll want to handle it differently. You’ll want to wrap the bars tightly in saran wrap and then foil and only keep them in the freezer for about a month. Defrost only in the fridge. Traditional cheesecake bars can be frozen by wrapping in saran wrap and freezing for 6 months. See our post on Instant Pot Peanut Butter Cup Cheesecake for a lot of information on cheesecake storage. The most important thing to know for how to cut cheesecake bars is to chill the cheesecake bars first. No shortcuts. You need at least two hours before you should slice into cheesecake bars so that everything is stable. I’ve started only making them the evening before so I’m not even tempted and they can sit in the fridge overnight. Heat a glass of hot water and emerge your knife in, wiping it quickly on a towel and then slicing the bars. Wipe the knife and repeat. That’s how our Lemon Blueberry Cheesecake Bars look so good! 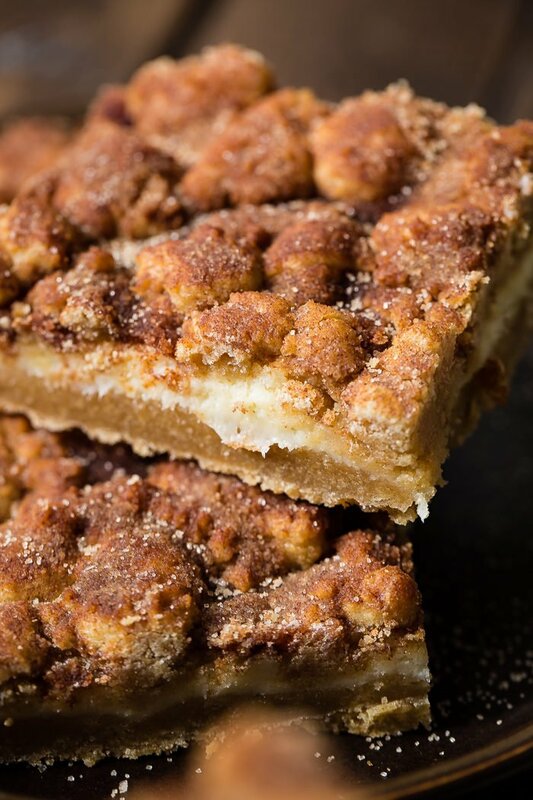 An easy snickerdoodle cookies recipe is needed to make these Fantastic Snickerdoodle Cheesecake Bars. You don’t need anything extra fancy or a blonde brownie recipe. We want that pure flavor that comes from snickerdoodles so let’s make a normal snickerdoodle cookie dough. Start out with your butter (or shortening) and eggs. Pulling these ingredients out first so that they can all be the same at room temperature will help the dough to bake up properly. 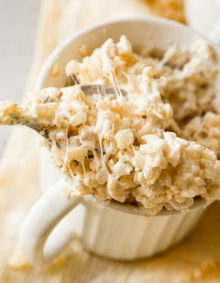 Mix all of your dry ingredients in one bowl to ensure that the leavener and cream of tartar are well incorporated otherwise it can get stuck in one area of the dough and not the others, which is why you may have one batch of cookies looking perfect in the oven while another is flat and lifeless on the counter. Cream the fat and sugars for at least 60 seconds. Butter and sugars beat together for a longer period of time make for fluffier cookies. Add everything else and you’re all set! This recipe calls for additional seasoning just to give that extra flavor against the cheesecake bars but isn’t normally found in cookie dough. 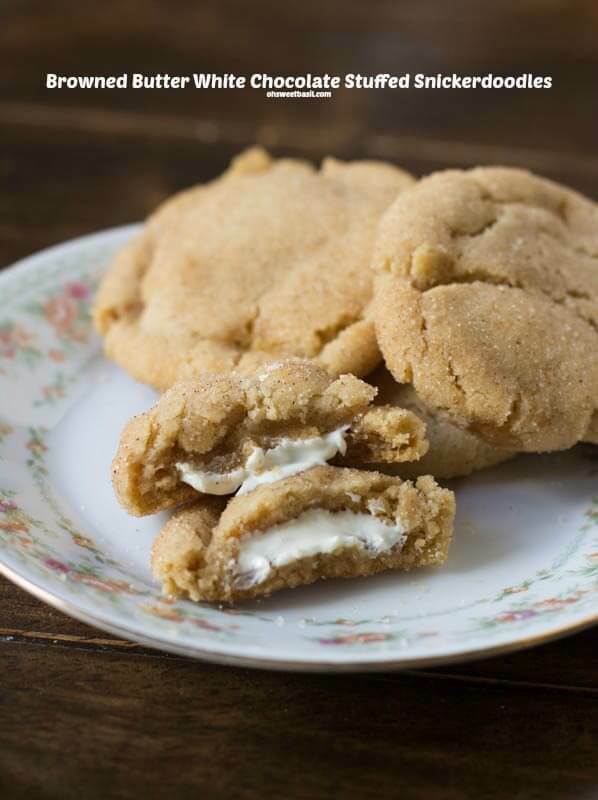 And by the way, once you’ve made these, try our white chocolate stuffed brown butter snickerdoodles. Good mercy. Why is There Cream of Tartar in Snickerdoodle Cookies? Cream of tartar in snickerdoodle cookies gives them a distinct tangy taste and also acts like as if you used baking powder although you miss that tang if you only use baking powder. Alright, do you HAVE to have cream of tartar in snickerdoodle cookies? I mean, no you don’t have to but snickerdoodles are known for that soft and chewy, and especially tangy taste which only comes from using cream of tartar because of the acid in it. If you don’t happen to have cream of tartar to make snickerdoodle cookies you’re going to want a cream of tartar substitute. 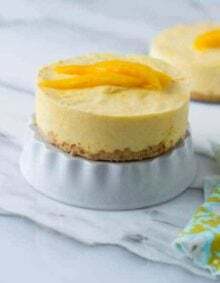 You can use 2 teaspoons lemon juice or vinegar to create the acidic effect of 1 teaspoon of cream of tartar in a recipe, but now you’ve added liquid to your recipe so the dough may be more soft. If your recipe called for both cream of tartar and baking soda you’ll need to take a different approach. One teaspoon baking powder is equivalent to 1/4 teaspoon baking soda plus 1/2 teaspoon cream of tartar. So depending on what your recipe calls for you’ll have to measure accordingly. How Long Do Cheesecake Bars Last? Cheesecake bars will last about 5 days in the fridge. Preheat the oven to 350 degrees. Line a 9x13" baking pan with foil and nonstick spray. Beat the butter and sugars until smooth, about 1 minute. Add in the eggs and vanilla and beat again. Stir together the cream of tartar, salt, nutmeg, cinnamon and flour. Add to the butter mixture and beat until combined. Press half of the dough into the pan. Set the other half aside. Beat the cream cheese until smooth. Add the sugar and vanilla and beat again. Finally, add the egg and mix until combined. Do not over-beat. Pour the cheesecake on top of the cookie dough. Crumble the remaining dough on top of the cheesecake. In a small bowl, mix the cinnamon and sugar and sprinkle all of it on top of the bars. Bake for 30 minutes, carefully remove to a wire rack or on hot pads to cool on the counter for 1 hour. Place in the refrigerator and chill for 2-3 hours before slicing and serving. Perfectly chewy snickerdoodle cookies stuffed with white chocolate and covered in cinnamon sugar! Dang girl! You did my cheesecake bar recipe proud! These photos look incredible. I seriously want to reach into my computer and pull some bars out!! 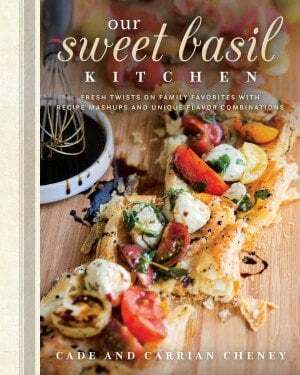 Thank you so much for sharing a recipe from my book. I puffy heart love ya!!!! Kissy face, kissy face, kissy face! We couldn’t have done it without your cheesecake genius!